The Complaint Handling module of Grand Avenue Software manages the feedback of information from the patient/clinic to the medical product producer and, where appropriate, from the product producer to the FDA. The major work elements of the Complaint Handling process include collecting and gathering product feedback, proper categorization and determination of the feedback, investigation activities when appropriate, and official reporting when necessary. The Grand Avenue Software Complaint Handling module automates and manages all these process phases and lifecycle activities. The Complaint Handling screen capture highlights a complaint moving through the investigation and reporting phases of the process. 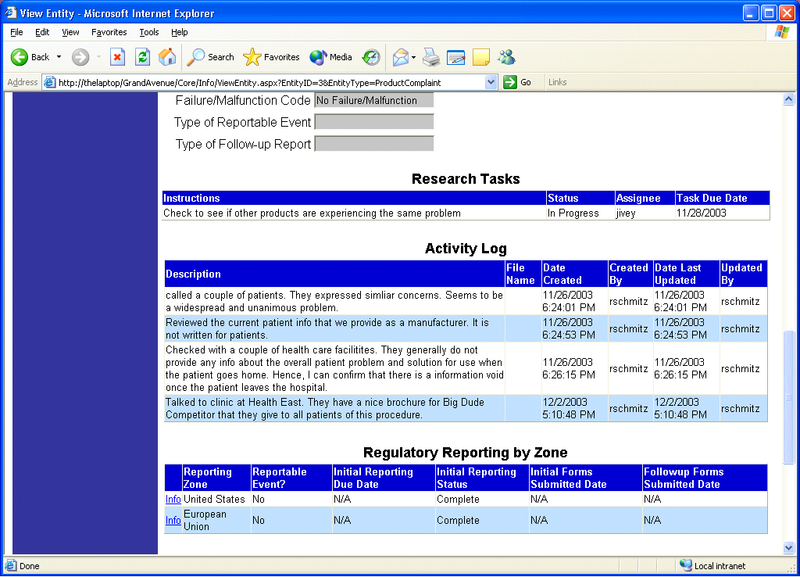 Investigators and researchers assigned to the complaint record their results in the Activity Log. This information is available for other people throughout the process as they work on the complaint. Reporting tasks and assignments are managed by geographical zone since reporting regulations vary from region to region.